Today, there are many ways you can enjoy your favorite Starbucks coffee from the comfort of home. One of these ways is to get a Capresso coffee maker. Well-known for their quality and exemplary design, these coffee makers allow you to brew, at home, your favorite cappuccino to provide that much-needed adrenaline to start your day. This article will guide you, giving you what you need to know about this coffee maker to get the best value for your money. What Is the Capresso 426.05? 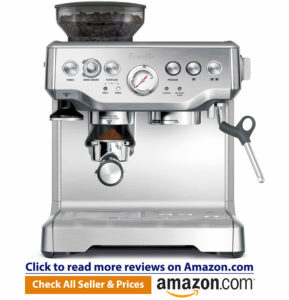 The Capresso 426.05 is one of the most highly rated coffee makers on the market today. Its popularity is due to several factors such as its design and ability to make quality coffee. As with other high-quality products, this Capresso coffee maker comes with a user manual you will need to follow to ensure safety when using the product, for yourself and your loved ones. Once you order the Capresso 426.05, make sure all the parts are intact and not broken. Before using the product, use warm water to clean the loose parts. Fill the carafe with water to clean the machine internally. Once you plug the coffeemaker into an outlet, the words “AM 12:00” will appear on the LCD screen. Press the SET button until the word “Clock” appears. Once you see it, push and hold the HOUR button to set time, then push and hold the MIN button to set the minutes. The automatic start function makes it possible for you to set the machine to brew at a specific time. To set, press the SET button until the word “Timer” appears. Once “Timer” appears, press the HOUR button to set the hour and the MIN button to set the minutes. The timer icon will switch back to clock mode once you set the timer. This Capresso coffee maker comes in a black/silver color. It has a unique and modern design that adds aesthetic beauty to your kitchen. With its 25-ounce capacity, it makes 5 cups of coffee. Its main parts include: a control panel for you to program as desired, and a carafe for storing your brewed coffee. It also has a showerhead enabling it to extract maximum flavor from the coffee beans. This coffee maker has a glass carafe and an ergonomic handle that protects your hand from heat while it ensures a maximum grip. It is easy to use because of its drip-free pouring capability. Unlike other Capresso coffee makers, this coffee maker comes with a permanent filter that’s economical to use since you will never have to buy filter papers for each brew cycle. This machine also comes with unique features, including an automatic start feature that allows you to program it for when you want it to start the brewing of your coffee. This way, you can wake up to find ready-made coffee in the morning. The carafe has a water level indicator to help one gauge the number of cups needed. It brews at a rate of one cup per minute to ensure you serve only quality coffee since it extracts maximum flavor from beans while making sure there is no over-extraction. You can purchase online, on Amazon Prime, for about $40. To ensure we give you an unbiased review, we picked a few similar products available on the market and used a 5-star rating system to see how they compare. You can purchase this product for around $40. Several features make this coffee maker easy to use, the most prominent being its automatic start feature. This feature allows you to program the machine so it can brew during specific times of the day or night. The machine brews at a rate of one cup per minute, and this makes it efficient. Its ergonomic handle gives it a firm carrying grip while also ensuring it is safe for use. For this, we gave this Capresso coffee maker a 4-star rating. This coffee maker can brew coffee at a rate of one cup per minute, and this makes its assembly time efficient. For this, we gave it a 4-star rating. If you are looking for a coffee maker that boasts of an exemplary design that will make your kitchen appear fancy, then the Capresso 488.05 is what you need. It is suitable for large families as it can brew ten cups of coffee in one brew cycle. This is possible because of its 10-cup stainless steel carafe. For easy handling, it has an ergonomic handle and a drip-free pouring spout that reduces the possibility of accidental spills. It has a 24-hour programming feature to ensure you can wake up to the aroma of ready-made coffee. To get a unique taste, it has a unique “Oily” coffee bean setting. Unlike other coffee makers, it has a permanent gold-tone filter making it economical to use as you will not buy a filter for every brew cycle. You can get this product for around $195. The Capresso 488.05 is easy to use because of its 24-hour programmability feature. This feature allows one to wake up to freshly brewed coffee. Other factors that make it easy to use include a removable water tank that makes it easy to clean. For this, we gave it a 4-star rating. This coffee maker has more parts when compared to the 426.05 model. This makes it more complicated to assemble, and increases assembly time. The 498.05 reduces the need for decalcifying due to its stainless steel-lined heating system. This Capresso coffee maker is not only visually stunning but also enhances the aesthetic beauty of your kitchen. It is efficient and can brew 10 cups of coffee in around 7 minutes. It has a permanent gold-tone filter, is easy to clean, and economical to use. You can purchase this product for around $140. It boasts of several features that make it easy to prepare coffee. One feature is its 24-hour programmable timer and a 50-ounce water tank. This coffee maker makes it possible for one to brew high-quality coffee in under 7 minutes. For this, we gave it a 4-star rating. Great features, such as a stainless steel heating system, ensure efficient and timely brewing at the right temperature. For this, we gave it a 4-star rating. Its stainless steel casing makes this coffee maker visually stunning. It also adds aesthetic beauty to your kitchen. It boasts of a removable water tank and a stainless thermal carafe. It has a charcoal filter and an electronic counter. For this, we gave it a 4.5-star rating. One unique feature of this Capresso coffee maker is that it can make 12 cups of coffee in under 10 minutes. It boasts of a permanent gold filter economical to use as one will not have to buy paper filters for each brew cycle. It has a glass carafe that boasts of an ergonomic handle for maximum grip. It boasts of a 24-hour programmable timer and an LCD section. You can purchase for around $40. With a modern and unique design, including a big carafe, you can use this coffee maker for large family gatherings. Below the carafe is a programmable timer with an easy-to-read LCD. For this, we gave it a 4-star rating.